Out of the Box: Going West Books and Writers Festival 1996-2011, opened on Thursday 16th August 2012 at the West Auckland Research Centre, Level 2, Waitakere Central Library, Henderson and runs until 16 September 2012. Find out more. ﻿The exhibition includes the use of touch screens with audio selections from the Going West Archive held in the centre's collection. Speakers include Maurice Gee, Michael King, Nigel Cox and Dorothy Butler. On the wall are copies of selected ephemera, artwork, photos and press-clippings capturing some of the Going West literary story. ﻿All recordings from the archive are available for listening in the centre's J T Diamond Reading Room. 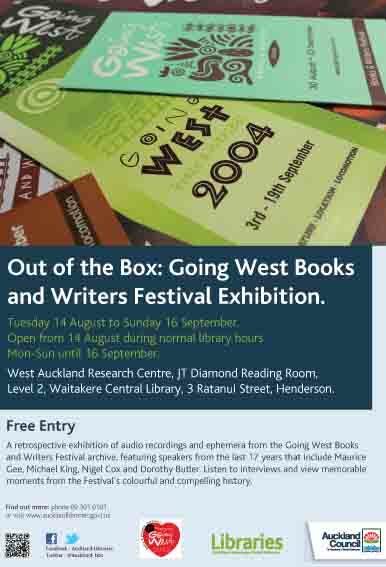 This collection includes many of New Zealand's literary luminaries.